Join leading policy makers, energy experts, and academics from both sides of the international border to discuss an increasingly important Québec-New England electric energy relationship and discover opportunities for further cross-border collaborations. 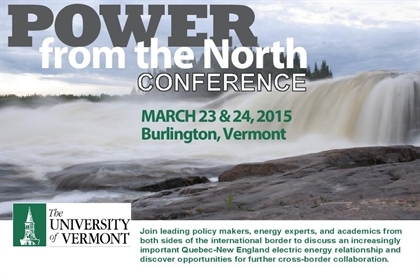 “Power from the North” is a two-day conference March 23 & March 24 at the University of Vermont. March 23 is designed to bring together leading policy makers, energy professionals, and academics from both sides of the international border to consider the increasingly important Quebec-Vermont/New England electric energy relationship. The conference will “tell the story” of this evolving relationship, examine its social, economic and environmental consequences, and ultimately inform present and future decisions regarding energy production, distribution and use in the Quebec-New England region, including the role that Quebec might play in de-carbonizing electric systems in Vermont. March 24 is focused on innovation, business and economic collaborations. Businesses from both sides of the border will participate in business-to-business meetings to encourage and foster cross-border partnerships, and bring innovative technologies to market.